Since October 1998, the American Geosciences Institute has organized this national and international event to help the public gain a better understanding and appreciation for the Earth Sciences and to encourage stewardship of the Earth. 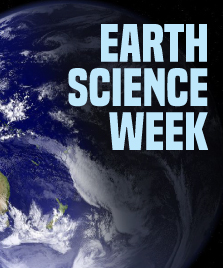 Earth Science Week 2017 learning resources and activities are engaging young people and others in exploring the relationship between human activity and the geosphere (earth), hydrosphere (water), atmosphere (air), and biosphere (life). This year’s theme promotes public understanding and stewardship of the planet, especially in terms of the ways people affect and are affected by these Earth systems.